In this session, I dive into busting some myths and straight-talking some truths about business success. I share a model I’ve personally enjoyed the past decade supporting a thousand clients of my own. Best of all, I have four SAFM students with me sharing their own stories of successful , fulfilling practices. This is an info-rich session with lots of pearls and inspiration! SAFM has helped many practitioners to transform their practices, their finances, and their futures. You will definitely enjoy hearing what they have to say in their own words. Unplugged and relaxed. Talking turkey to inspire You! Myths and naysayers abound in this burgeoning field, especially on social media, and they are holding back many practitioners from believing in the future they most want. I am tired of hearing people protest, “You can’t make a good living doing this work.” That is simply not true. So I’m taking a stand! It’s time to reverse that momentum and set expectations for Success. No catch. Just valuable learning you’ll be able to use right away. Once you check it out, Please add a comment below to share what most resonated with you in this session; as always, I am very interested in what you think. If you are not yet a student of SAFM and have questions, you may find more information about the Core 101 Semester Program here. Or click here and we can happily arrange for you to speak with an SAFM graduate about our program and how it may help you in your specific situation. SAFM is definitely not for everyone. But it may indeed be the next step you are looking for that will Change Everything! You can view and download presentations slides here. Like us on Facebook to get more great clinical tips and to get notifications of other events like this! Thanks for the session–inspiring, informative, and encouraging. I love every webinar you offer. You are an inspiration. Just signed up for the January 2019 semester. Excited but anxious and nervous. Now I am working on my Bonus course—Cancer. Hi – thanks for the informative program. I’m starting my first semester with SAFM in September. I’m a nurse practitioner and therefore do not have any control over what is charged for my care. 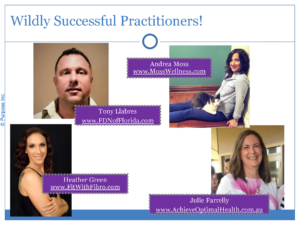 I’m moving into my own functional medicine coaching practice eventually. How do you know what to charge? Is there some guideline for package, session and consultation costs? And… will people balk at this care being cash based rather than insurance based? Welcome to the SAFM family! Indeed, when you registered, one of your initial emails points you to a special bonus class called “Practice Pearls” which includes a number of considerations and recommendations on how you might structure, promote, and run the business aspects of your client/patient work. At SAFM, our focus is on teaching clinical content to enhance your patient outcomes, so we don’t focus on business processes as core content. However, this topic is discussed often among current/veteran students on the community Forum (a great place to ask your questions after Core 101 students are added to it about 5 weeks into your semester). You’ll also have a Peer Group Huddle you may consult – a smaller group of people with similar credentials/background. And for now, again, the Practice Pearls course may give you some helpful direction and start whetting your appetite for the business opportunities to come. Enjoy!